Launched in 2014, Fruity Casa Casino has continuously provided players with thrilling and rewarding online Casino games. The Casino is owned by Cadell Limited N.V. and offers punters an amazing selection of slots and scratch cards from some of the best online gaming software developers. Having been in business for four years already, Fruity Casa Casino has already cemented its place in the competitive online gambling market. The Casino offers players an amazing experience with its amazing selection of slots, a robust SSL security system, live dealer rooms, and a committed and professional 24/7 customer support team. 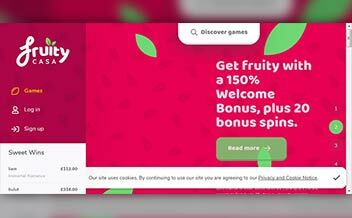 Fruity Casa Casino has an alluring welcome bonus package for new players as well as in-play promotions for existing players throughout the week. When you sign up at the Casino, you’re automatically rewarded with a 150% bonus on your first deposit up to €250. Additionally, you also get 10 Gonzo Quest’s spins. The Casino also offers free spins and reload bonus on deposits made on both Mondays and Wednesdays. Get 20% bonus on your first deposit, 25% on your second, and 30% on your third deposit every Wednesday. 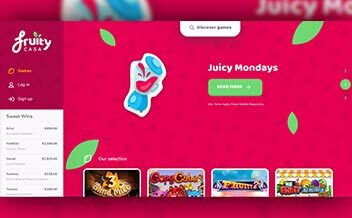 Fruity Casa Casino offers punters a variety of slot games developed by developers such as Microgaming, NetEnt, Betsoft, Leander Games, NextGen Gaming, among others. 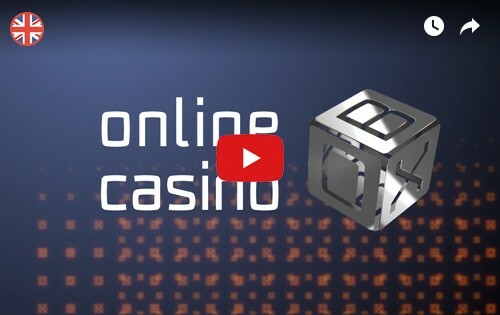 The games are developed to meet the needs of the online gambling market. Some of the slot games include Twin Spin, Sugar Pop, Aliens, among others. The Casino doesn’t forget the table game fans as well. The different software developers make sure that the Casino has something for every player. Some of the popular table games offered by the Casino include American Roulette, French Roulette, Single Deck Pro Baccarat, Caribbean Stud, Hold’em, among others. Fruity Casa Casino also offers punters with a great selection of video poker games that are tailored to enhance the experience. Fans are assured of unmatched experience in this section of the Casino. Some of the common video poker games offered include; Deuces Wild, Joker Poker, and Jacks or Better. The Casino is powered by various software developers. This cohesive partnership between some of the industry’s best developers renders the software powerful and easy for players to navigate through. 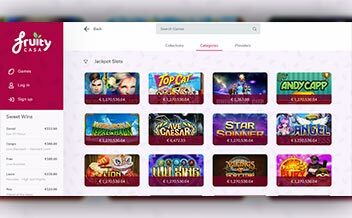 Some of the developers include NetEnt, Microgaming, NextGen Gaming, BetSoft, Aristocrat, 1*2 Gaming, Elk Studios, Leander Games, Genesis Gaming, among others. The United States, Australia, Belgium, Iran, Kenya, Spain, Denmark, Turkey, Netherlands, Israel, France, Bolivia, Pakistan, Bulgaria, North Korea, Tanzania, Nigeria, Sri Lanka, among others.  Bank Wire Transfer, Neteller, Mater Card, Paysafe Card, Maestro, Visa Electron, Skrill, Visa, Trustly, Giropay, Ukash, among others. US dollars, Australian dollars, Canadian dollars, British pounds Sterling, Norwegian kroner, Euros, South African Rand, and Swedish kronor. Fruity Casa Casino runs on various browsers such as Mozilla, Chrome, and Opera. The Casino is also available in instant play and mobile devices. The Casino is certainly accessible, and players can enjoy their preferred games while on the move. The Casino is available on Android and IOS devices. Fruit Casa Casino presents a colorful destination with an amazing assortment of slots and scratch cards. 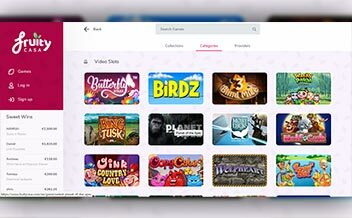 Bringing together many software developers, the Casino has ensured that there is something for every player. Players are assured of an amazing experience in the Casino with the variety of both virtual and live online Casino games.